When I began building my indoor aquaponics system a couple of years ago I made a few (a lot) of mistakes preparing the barrels and cutting holes. I found various easy (but not very pretty) ways to seal up these lapses in judgement. The most common method I have used to fix a 2" or smaller hole was with small pieces of plastic and silicone. I cut off the lid of a plastic food container like sour cream or cottage cheese and then used small screws and silicone to seal up the hole. This worked great for a while but I noticed the silicone seems to break down after about a year and leaks began to form. A few weeks ago I was contacted by Flex Seal to try and demo some of their products and I couldn't have been happier since I was sick of emptying little plastic drip catching bowls! The product comes in several colors so I choose to try the clear for this application since it would look the least intrusive on the white barrels. 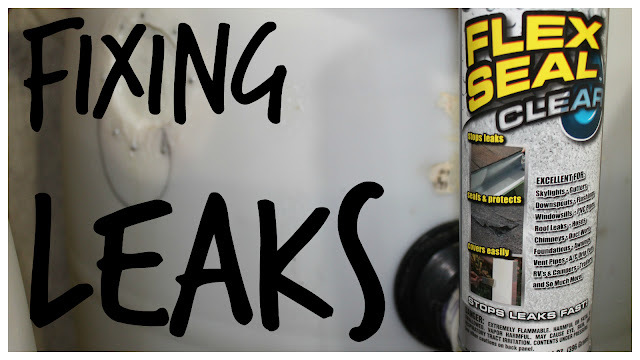 Flex Seal is a spray on rubberized coating that can be applied to pretty much anything that needs to be sealed. I started by turning off the aquaponics system and bringing the water level below the area that needed to be patched up. The surface needs to be clean in order for the Flex Seal to stick so I removed any old silicone and then used my homemade spray cleaner to remove any dirt, oils, or debris from the area. Once the area was prepped I started to spray on the Flex Seal. After some vigorous shaking I applied a light first coat and let it dry for a few hours. I then came back and sprayed on a second coat. I let this dry overnight and then first thing in the morning I sprayed on a few more coats letting it dry for 3-5 hours in between. This gave me a nice buildup of the sealant over the area and since the product is a bit thin going on it seeps into all of the small cracks and holes to create a fairly ridge waterproof seal. Once the product had fully dried (24 hours to be sure) I fired on the pumps and air stones and let things start cycling as normal. It works! No leaks and the area looks much better than I expected and doesn't catch your eye when you look at the system. I couldn't be happier with Flex Seal so far and I am starting to think of all of the others areas I could use it around the house.